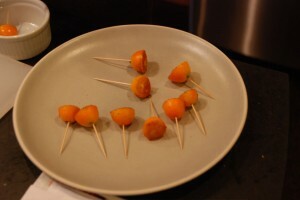 A couple years ago, an Amanda Hesser food column in the Sunday Times Magazine inspired me to do a little popsicle/craft project with kumquats. Kumquats are an odd little fruit — the peel is the sweet part, while the inner fruit is quite tart — and I lived over thirty years without ever eating one. 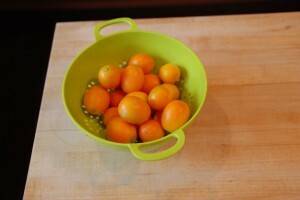 But here in California, kumquats are one of the available fruits this time of year, and so we eat them. Back when I first read the article, Ben had never heard of the fruit, so I started by manufacturing excitement; just saying “kumquat” a few times was all it took. Try it. We had a brief setback, the night before market day, when Ben fell prostrate to the floor, crying “But I want kumquats now!” But we got past that, and in fact, the interval between getting the fruit into the house and eating the finished product is quite short, which is always a bonus when you’re cooking with people for whom the phrase “delayed gratification” is a contradiction in terms. 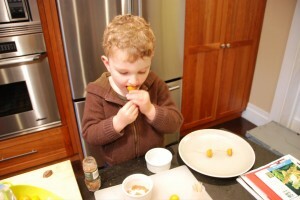 So if you happen to see some kumquats in your market, try this with your kids. Note: the original recipe calls for dipping the kumquats in raw egg white to help the sugar stick, but that step’s unnecessary (and runs the very slight risk of exposing you to salmonella). The kumquat juice is enough to do the job. 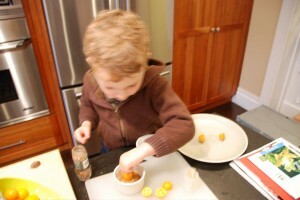 You need kumquats, a dish of cinnamon sugar, and some toothpicks. 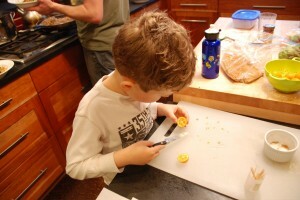 Slice the kumquats in half horizontally. Use the point of the knife to flick out any seeds. Stick a toothpick into the stem end so that you’ve got a handle. Dip the cut end of the fruit into the sugar and cinnamon. Lay the fruit on a freezer-proof plate or tray, and then stick into the freezer for an hour or so. Or eat before they’re frozen. This does look like a cool project. 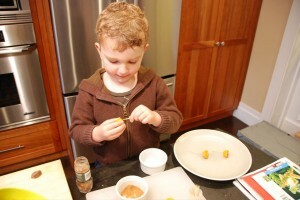 I bet you could do thid with many different fruit to create something yummy for your kids to do.